Lockheed Martin has landed its first contract for the hybrid airship it created inside its top secret Skunk Works division. In a deal valued at $480 million, Straightline Aviation (SLA) has signed a letter of intent to purchase 12 of the heavier-than-air airships that measure nearly a football field long. First delivery is scheduled for 2018, with the final airship expected no later than 2021. The helium-filled airships will be able to carry 20 tons of cargo to remote places without roads. They will even be able to hover over open water. Lockheed has been pitching the airships as a cheaper, more environmentally friendly way to deliver supplies and equipment. 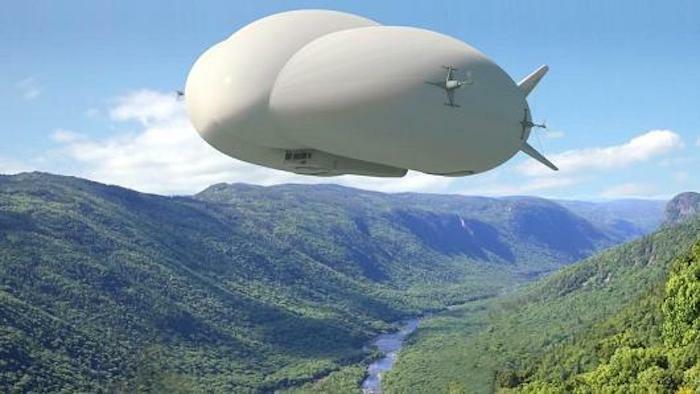 Lockheed Martin's new LMH1 airship to hit the market in late 2018. "There is a real need for this," said SLA CEO Mike Kendrick. "It can cost up to $1 billion to put all the infrastructure in for an oil well." He said falling commodity prices have not hurt interest in the airships — quite the opposite, given the cost savings — and U.K.-based SLA has four or five customers ready to try out the airships whenever they're finally ready. Kendrick used to run Richard Branson's Virgin Airship and Balloon Company, which had 19 blimps around the globe used for advertising or camera work. He was also flight director for Branson's balloon flights. He and his team formed Straightline to focus initially on delivering cargo. What attracted SLA to the Lockheed Martin product is that the hybrid airship is heavier than air, even though it is filled with helium. Its skin and airframe weigh it down, it doesn't need mooring like a traditional blimp. Engines guide the airship into position, and on its belly are wheel-like structures that spin to let it either hover or "grip" a surface. Lockheed said this provides stability in windy conditions for loading and unloading supplies, making it much easier to operate than a lighter-than-air machine. "The difference between lighter-than-air and hybrid airships is quite profound," said SLA's CEO. "It may seem small but it is a spectacular development." Lockheed proved the concept a decade ago with a one-third size prototype, and it has spent years figuring out the right size and the right markets, spending more than $100 million on the project. This is also the first time that Skunk Works, a division of Lockheed Martin more famous for creating legendary military aircraft like the SR-71 and Stealth fighter, has developed something for the commercial market. The company even created a special sales and marketing arm, called Hybrid Enterprises. 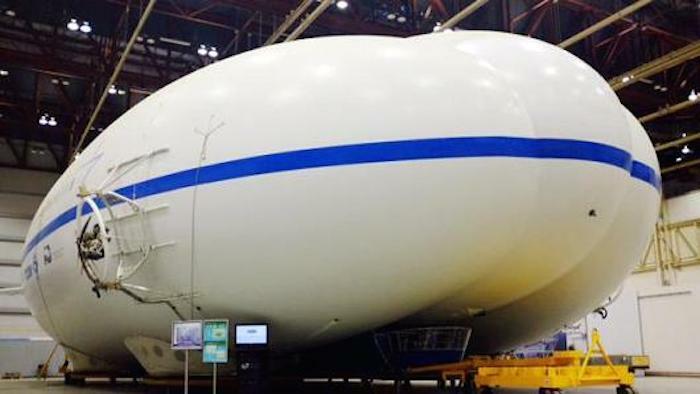 There are competitors, most notably the Airlander 10 being built by U.K.-based Hybrid Air Vehicles. The Airlander was unveiled last week and labeled the world's largest aircraft, a lighter-than-air hybrid that may focus more on the tourism market. Straightline COO Mark Dory said his company has also been talking to HAV about a potential deal in the future and is "very hopeful" the Airlander will be a success. However, he added, "at the moment, our focus is in cargo rather than the the passenger side." But the passenger side is on the horizon, along with other potential markets in disaster relief, communications, agriculture and renewable energy. SLA's Kendrick said oil, gas and mining are the "low hanging fruit," to start with, whether it's delivering cargo by air to the "soft sands" of the Middle East, or removing the need to build annual ice roads in northern Canada. "Some ice roads can cost $20 million a year to construct," said Rob Binns, CEO of Lockheed Martin's Hybrid Enterprises. That is one market SLA hopes to target. "You don't have to build ice roads ... and wait for the environmentalists to give you permission," said CEO Kendrick. "You can just land on ice." Lockheed Martin prototype exterior of its new airship. The Hybrid Airship is a project more than a decade in the making. Ten years ago, Lockheed flew a smaller prototype, called the P-791. In classic Skunk Works fashion, it didn't tell anyone a test flight was coming, but no one driving through Palmdale, California, that morning could miss it ("We probably should have told the CHP," one official confided). Over the next decade, the company tried to figure out a market for the product. It finally settled on commercial cargo to remote areas. Cool thinks the biggest market could end up being consumer goods. "I mean, I've been to Central Africa, and there's people with cellphones using Google," he said. "What they don't have is access to the goods and services that the rest of the world has." There are huge risks. Commercial airships haven't really gotten off the ground as an industry, beyond blimp advertising over football games. Lockheed is also facing competition. Companies such as Aeroscraft and Hybrid Air Vehicles are building their own airships, but Lockheed believes it will hit the market first. New FAA certification rules have been developed for the LMH1, and Lockheed hopes to have the first approved production models flying by late 2018. The LMH1 will land on three cushions that can suction to the surface. It can also merely hover as cargo is moved, even over open water. It will fly below 10,000 feet, where the air is denser and can provide more lift. Maximum speeds will be 75 to 80 miles an hour, "faster than a ship." On a full cargo load at full speed, Boyd said the LMH1 can go at least 1,400 miles, "But if you slow down, you can go a lot farther." How far? "You actually go all the way around the planet ... on one tank of gas." One of the unique things about the LMH1 is that is intentionally heavier than air. Cool said this is important when your goal is to load and unload cargo. "We start with a very heavy vehicle that will sit safely on the ground, and then figure out the flight components after that," he said. The company said that flying the airship will be cheaper and quieter than traditional aircraft, and the plan is to sell between 200 and 500 of them. If the LMH1 succeeds, bigger airships will follow, some the size of the Rose Bowl. "Eventually we hope to get something that maybe is as much as a million pounds of cargo, and at that scale the cost goes down, so we get significantly more competitive," said Boyd. Initial sales will be directly to customers, but the company believes that in the future it will sell the airships to leasing companies, much in the same these companies lease aircraft to airlines. The first sales should be announced in a few weeks. Even as commodities prices have collapsed, Lockheed said potential clients in oil, gas and mining are thinking 10 to 20 years out, and they see airships as a way to save upfront infrastructure costs. However, some of these locations are in dangerous areas of the world. Boyd said the LMH1 can survive bullet holes. "It doesn't pop like a balloon ... we are still a military contractor, so we do know how to do defensive systems." But as Lockheed faces a shrinking defense environment — it announced 1,000 voluntary buyouts across its aeronautics division this week — the people at Skunk Works are getting outside their comfort zone to sell to a market which has nothing to do with the Pentagon. "Yeah, we're not used to doing things like this," laughed Bob Boyd, "talking to the media."